I have been interested in purchasing the singing synthesizer but controlled myself because the starter pack of the only real option, Vocaloid, costs over 200 Euros. 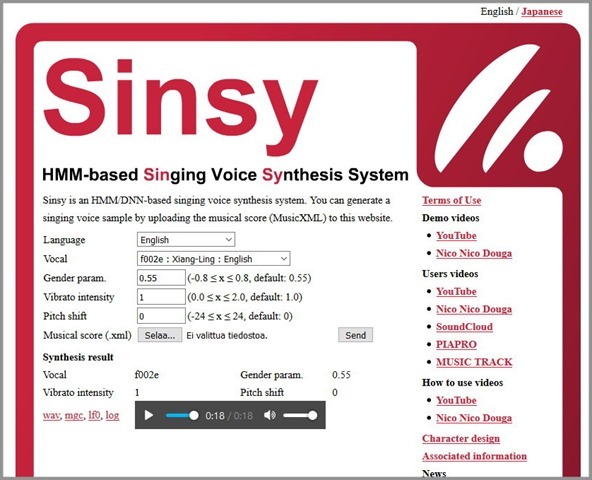 After looking for the free software on the Internet for some time I came up with Sinsy, the online HMM-based Singing Voice Synthesis System (see the picture above). It converts xml.files into wav.files. In order to do this you can write the notes and lyrics in MuseScore, which is free notation software. When you are ready with your song you export it in an xml form to your hardware and from there you upload it to Sinsy by clicking the Selaa –button. When you have picked up your song you should click the Send button. If you are happy with the result you’ll save it in a wave form by clicking the wav-title. This song is an old Finnish folksong in which K. Rautio has written the lyrics. It was very popular song at school and it begins: “I know the place dear, tranquil and wonderful”. 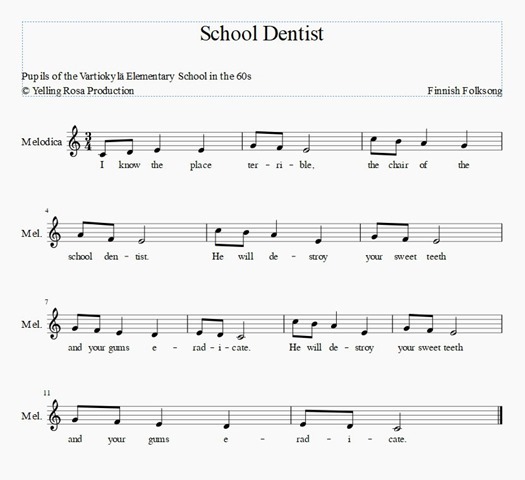 We, the pupils of the Vartiokylä Elementary School in Helsinki, sang it with our own words while transporting to the school dentist clinic. At least then we felt that school dentist were too rough because we suffered even from pain and bloodshed. Perhaps it was only a question of drills which didn’t use water at those days but some water was needed so that the drill bits didn’t run hot. You can rely on that we waited those swigs of water while sitting in the chair of the school dentist. The chair of the school dentist. Sinsy is a very good aid also when you want to test voices. In that case you must convert every voice to xml format separately with MuseScore. If you try this with the score Sinsy will do the job by putting voices on the one line and do them in a row. 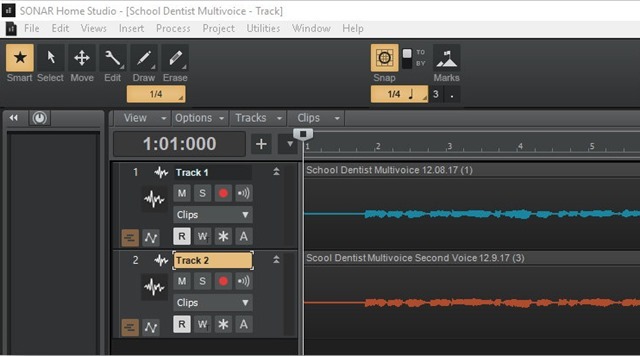 The cutting those in parts won’t be easy in any studio program that you need to play many voices at the same time. I have Sonar Home Studio which is not an expensive program and which you can test 30 days free. Because it is a cheap program it has its limitation, of course. For some reason Sinsy leaves the empty gap at the beginning of the wave files. I found it very hard to cut off so I left it there because the silent gaps don’t bother when every track has such. Don’t become disheartened with all this information. In the long run it will save you from wasting energy and lots of time. Please view YouTube videos to get more information when needed. I wish you happy times with your songs. My 22 videos are viewed 30140 times during 2012-2017. This entry was posted in English, Finnish, Languages, Literature, Music, Poetry, Society, Technology, Visual Arts. Bookmark the permalink. Absolutely fascinating, don’t think I’m quite clever enough with a computer, but my clever computerman brother might give me a hand. Thanks for the information. Thank you so much, all so very helpful. That would be much too complicated for me but I did enjoy viewing it on You Tube. I could use the sheet music to play it on the piano though. Dentists were really scary for children back then. I remember those days well and appreciate my gentle dentist with wonderful equipment today! Thank you for commenting. Yes, equipments are great today. Scary. Fascinating. Cool. Did I mention Scary? Thank you for commenting with the verse. At least that bad it was. Just fantastic and you so clever !!!! You’re right: children are innovative. At least for me Sinsy has been handy. Rosa this is fascinating software. I never thought about something like it existing. Now I’m very curious. Hugs. Thank you for commenting. I am happy that you are excited about Sinsy. I add more information about Sinsy and polyphonic to my post. Please read from the Melody in Parts title downwards.